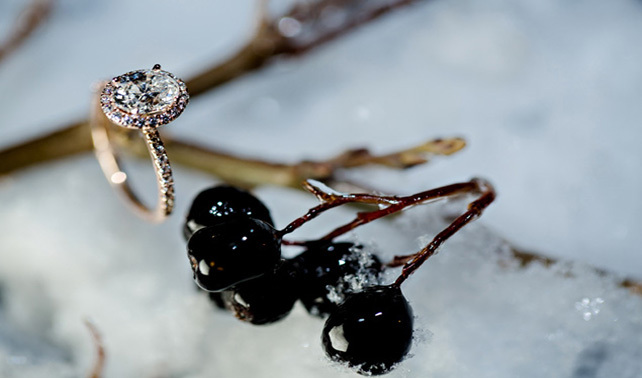 Today we have a romantic winter proposal to share with you! 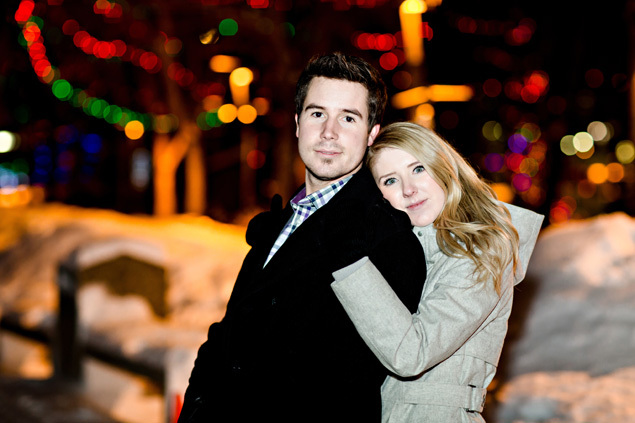 This nighttime shoot was bravely captured (partially from behind a snowbank) by Elizabeth of� ENV Photography. 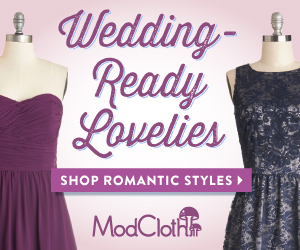 Although the setting itself was cold, this adorable couple will melt your heart. Elizabeth: Matt had contacted me about photographing his proposal to Emily and we worked together to find just the perfect place to photograph it at night and to be able to keep it a surprise. Night photography is difficult, so we needed a place with great lighting to be able to make it work without having to add flash. 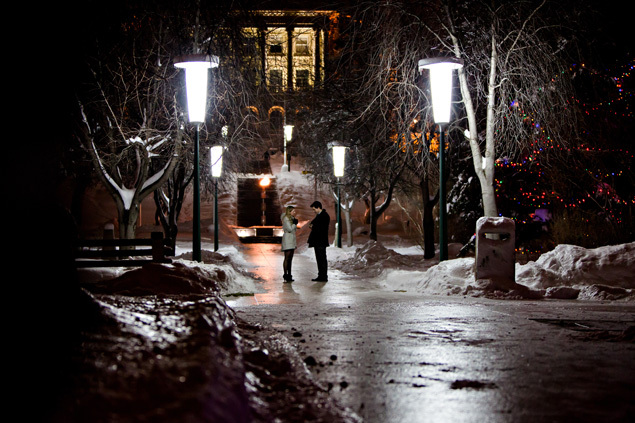 Matt had suggested the Legislature grounds in Edmonton for them to take a stroll through after going out for the evening. 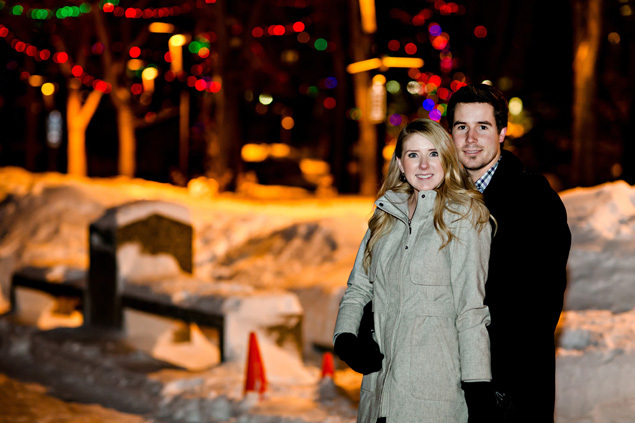 The area with the Christmas lights was a bit too dark, but the spot we ended up using was just perfect. After carefully timing things, I hid in a pile of snow just South of the spot and waited for them. We had a terrible round of freezing rain that night so things were running a bit behind. I waited in the snowbank for probably 30 minutes watching for them. I’m still surprised no one wandering the park had called security to report the weirdo with a camera laying in the snow bank. haha. Then, I saw them make the approach so I popped up a little bit, afraid that Emily would see me. As it turns out, I’d hidden well enough that Matt wasn’t even sure I was still there, so he went on with the plan. It was absolutely beautiful capturing Emily’s surprise and happiness. I still get goosebumps when I think about it and when I look at the photos. Once the couple had a few moments to take in what happened, Matt pointed me out to Emily and then she discovered that her proposal was captured secretly! We then had a quick photo session and the couple shared some hot chocolate before heading off to enjoy the rest of their amazing night!